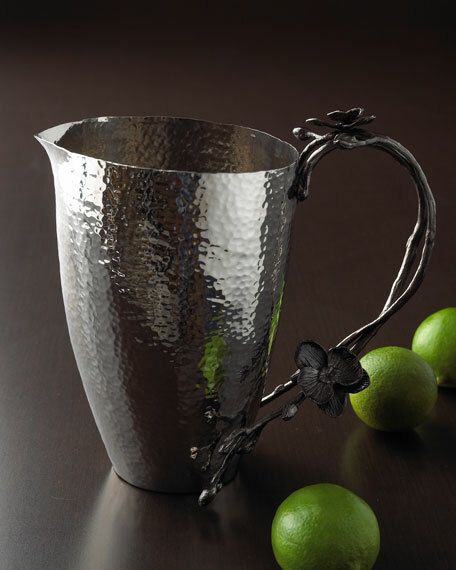 Pitcher made of stainless steel and black nickel-plated metal. Pitcher has heavy-gauge, hand-glazed steel underbody with hand-painted Courtly Check® decoration. Bronzed stainless steel rim. Dishwasher safe but hand washing recommended. Due to the nature of handcrafting, pieces may vary. 9"W x 6"D x 8.5"T; holds 3 quarts. Imported. Heavy gauge hand-glazed steel under body with hand-painted with courtly check decoration. Pieces may vary due to the handmade nature of each product. 5"Dia. x 8.5"T. Holds 7 cups. Imported.